Whether your organisation is solely a GST registrant or both a GST and a QST registrant, our software will apply the tax calculation once you select the GST/HST/QST profile applicable to your case. Input Tax Credit (ITC), which is the GST and the HST claimable on your purchases, and Input Tax Refunds (ITR), which is the QST claimable on your purchases, will be calculated accordingly. Organizations that are large businesses for QST purposes are subject to the phasing out of the restricted input tax refunds on some properties and services. Generally, a large business refers to those making taxable supplies worth more than $10 million annually. As the case may be, taxable supplies made by associated person have to be included in determining the $10 million threshold amount. RTG: 186 Temporary Recapture of Certain Provincial Input Tax Credits. 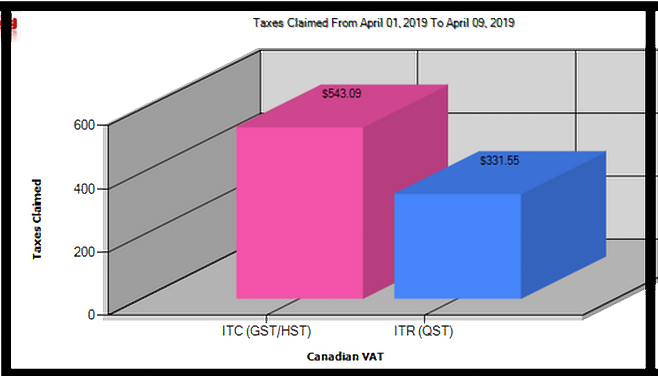 Generally speaking for other provinces, the recovery of inputs is done fully as well as the GST in Québec. Advataxes is not asking your employees to select tax codes but simply to select a transaction date, an expense category and the province. The accounting posting is done automatically subject to adjustments. This prove to be a very efficient way to proceed as the difference between taxes claimed and taxes that should have been claimed is about 1%. For further details see our page dealing with our tax management surveys. Organisations that are small and medium businesses for GST and/or QST purposes are governed by a different set of rules from large businesses. These organizations are not covered by the recapture of input tax credits under the GST regime or by the restricted input under the QST regime. The setting functionalities have integrated this GST/HST and QST specificity for you to choose from. Organizations that are engaged in both commercial and exempt activities have to apportion their input tax according to their ratio of commercial activities. Again, simply pick the ratio of commercial activities in the setting that is applicable to your employee expenses under the GST regime and under the QST regime in order that these ratios are taken into account in the calculation of input tax claimable and remittable. Financial institutions under the GST regime are governed by a specific set of rules with respect to apportionment of ITCs; the input tax to claim equals the ratio of commercial activities. It is this particular rule applicable to financial institutions that is automated. Also, with the harmonisation of the QST regime with the GST since January 1, 2013 with respect to financial institutions, the same is applicable for QST purposes.